- what glue do you use? - how best to mix it? - doe it take stain and finish like the surrounding wood? I routinely mix yellow wood glue with fine sanding dust to fill surface blemishes and have done so for several years. I have thought about experimenting with white wood glue for a better color match, but have not done so. I collect sanding dust from the dust collection canisters on the Porter Cable random orbital sanders and keep walnut and red oak (woods with which I mostly work) dust in containers for this purpose. I have taken two approaches to using wood glue and dust to fill in imperfections. Both seem to work equally. Whether these methods work well or bad I guess is a matter of personal opinion, but I prefer this type of filler to clear-curing epoxy, commercial wood filler, and waxy post-finish fillers. In the first method, I apply wood glue to the defect and then press sanding dust (from the wood being repaired) into the glue. In the second method I mix the sanding dust with wood glue to a consistency of a little thinner than that of peanut butter. I mix by squeezing a dollop of wood glue onto a smooth piece of scrap wood. I then slowly sprinkler sanding dust over the glue and stir. I continue adding dust until I have obtained the consistency that allows me to transfer and press the glue-dust mixture to the defect. The mixture is lightly sprinkled with sanding dust before pressed into place. The light sprinkle reduces the extent to which the mixture sticks to my fingers. Sometimes I have used a putty knife to screed the filler, but if the mixture is too thick, the putty knife can lift the filler from the defect. The “open-time” with this method is fairly short (maybe 10 minutes). I find that once the glue-dust mixed has cured, a second or third application is required to build the glue-dust mixture proud of the surface. Once the glue is cured, the surface is sanded flush. I try to fill the defect just before sanding to final grit. For example, if my final grit is 180, the filler is applied after sanding to 150 grit. The cured filler is sanded flush with 150 grit and the entire workpiece sanded to final grit. I tend not to stain my projects; I generally apply a clear film finish (oil-based urethane or polyurethane). The repaired area tends to be darker than the surrounding area and seems to take the finish well. The filled defect on a finished project produces an interesting affect. The defect invites a touch. It is a surprise when the defect (darker area) is found to be flush with the surface; something that is unexpected. Thanks Jbrow. You method number 2 is exactly what I’m experimenting with tonight on some scraps. I also picked up some Famowood which is my usual go to for filler. I need to do some finish test samples anyway so I’ll see how they come out. If I’m doing something that has a natural finish I will mix up some using white glue. If I’m doing something to be stained I won’t make my own, I normally use Famowood filler. Dont do it. When you apply stain you will see why. For minor fills, I have used the Dave Marks technique of filling it with sawdust and dripping CA glue to set it. For the sawdust, I collect larger flakes from around the router table after raising panels, etc, and put them through a Krups spice and coffee grinder. I’ve also collected it from my sander dust bag. That is a very fine powder and is OK for very small imperfections in glue joints, but for anything on the surface, I prefer the slightly coarser dust from the grinder. I find the coarser powder stains more naturally since it is more porous. Neither will be invisible after finishing, but with a wood like knotty alder, it’s difficult to distinguish the repairs versus the natural features of the wood. Given the type of fine furniture you are building, it’s hard to picture that sort of repair being acceptable. It’s going to stand out I’m afraid. I know you specifically asked about glue and sawdust fill, but what I’ve been working with lately are the various types of burn in sticks from Mohawk. It’s intended to be used on finished wood, so the repair is done after finishing. There are dozens of colors, and they can be mixed to create just about any color you need. In between projects, I like to try to improve my finishing techniques and learn new ones on test boards. I’ve had very good results with the sticks so far, to the point where I have difficulty finding the repair even on small sample pieces that I’ve finished, gouged and repaired. Before springing for a dedicated hot knife, I attached a piece of 0.015” feeler gauge to a soldering iron to test the sticks. It works pretty well. I also picked up some pallet knives at the art store and can use them with a heat gun for a surface to blend on. Right now, I don’t really picture doing glue and sawdust fills in the future, since this is working out to be easier and the results are outstanding. There are videos on the Mohawk site for more info. I’m still in the learning stages, so I’m not ready to offer any definitive guidance. Rich- I hadn’t thought of using burn-in sticks, I’ll look into them as an option as well. It’s a very small gap, about 1/64”. Unfortunately it’s in a very visible space on the top and outside edge of a table top I’m working on. Any other ideas on how to fix this are welcome. wait end grain . i would think that this is not going to be easy . i do not know what your building or the detail . If this was a kitchen cabinet I was building i might rub a similar colored caulk in the gap and walk away . if this is a “piece” I might change the detail ,maybe add a dutchmen or a wedge of wood following the line of the joint . what needs to happen is to get the black line to go away .then it generally will not be seen . ahh -I feel your frustration .been there . alot easier to swallow when it happens years down the line . that hot wax idea might work here .be a good repair method to have in the shop .has to be something that has give .far better to have a crack in the joint then cracked filler . It s a very small gap, about 1/64”. Unfortunately it s in a very visible space on the top and outside edge of a table top I m working on. Any other ideas on how to fix this are welcome. You will have a very difficult time getting that to disappear. I’m a big fan of “happy accidents” ala Bob Ross so consider accenting with an inlay. I prefer to use sawdust and hide glue. I think it blends in with most finishes better. I will experiment with cutting a sliver to fit. 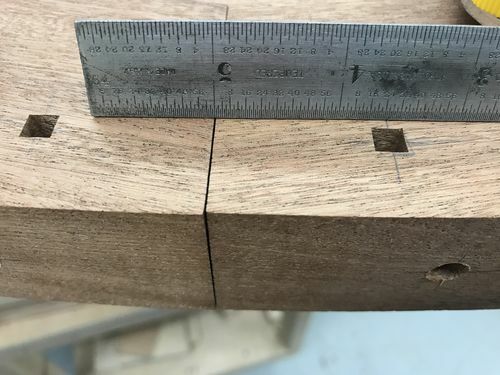 It might be hard to cut a 1/64” sliver of wood to fit in there…..
You can run a flush cut saw down the gap until the pieces fit together tight. I’ll try to cut the sliver end grain. I still have all the drop offs, I should be able to find the one that came from this piece easy enough. Replacing it is not an option, unfortunately. Already glued on, would do more damage trying to remove it. The segments are all sequential/grain matched, a replacement would look out of place. The photo is making it look worse than it really is, the gap is only about 1/64” or so. Some sort of filler is the likely fix and I’m sure I’m the only person that will ever notice it (well, and now all of you too!). But it still bugs my perfectionist side…..